Protecting group: A temporary group added during organic synthesis to prevent a portion of a molecule from reacting (i.e., it assists chemoselectivity). Protection is usually considered an undesirable synthetic strategy because it adds two steps (protection and deprotection) to the length of the overall synthesis, and because the added steps usually cause a decrease in overall yield and reduces atom economy. A painter's drop cloth is a useful metaphor: It prevents paint from getting on undesired areas (such as the floor) but adds extra time, effort, and cost to the painting process because the drop cloth must be put down before painting, and picked up afterward, and because the drop cloth adds cost to the process, and increases waste. Without a protecting group, both the alcohol and aldehyde are oxidized by Jones reagent. This oxidation is not chemoselective. When the alcohol is protected with a tBDMS group, only the aldehyde is oxidized by Jones reagent. Thanks to the protecting group the oxidation is now chemoselective, but the synthesis is now two steps longer because of the protection and deprotection steps. 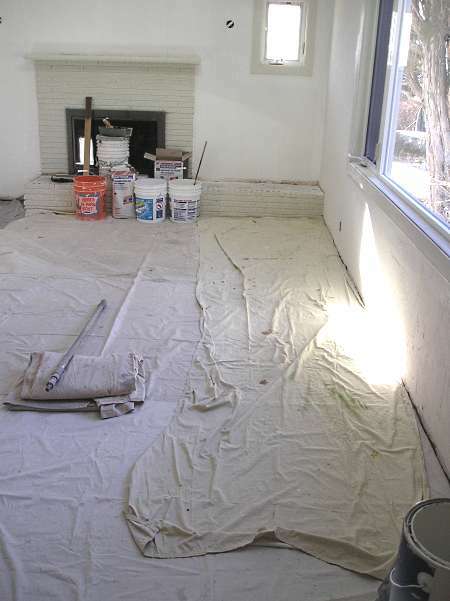 A drop cloth protects the floor from dripping paint. Its use adds extra steps to the painting process, because the cloth must be laid down before painting begins and picked up when painting is complete.